Home Informations Guides and Advices for Chihuahua Chihuahua Senior Dog Care, Guide and Advices. As your chihuahua matures you may notice gradual changes that signal the senior years. Knowing what to look for in your chihuahua’s behavior and health can help you manage senior dog care. Let’s discuss some significant signs of aging in your chihuahua senior dog and how to work around them. Due their small size, active chihuahua’s give wear to their muscles, bones and joints. They live in a world made for larger beings. To offset some of the wear, you can use steps beside taller items you chihuahua may usually jump up to or down from the object. Picking them up rather than allowing them to jump is a good substitution if you’re around them for the major part of their days. In their senior years they could have stiff joints and sore muscles on a regular basis. Giving supplements like glucosamine can help ease some of these common discomforts. For more info visit: Patella Luxation in Chihuahuas, Guide and Advices. Chihuahuas common lose some teeth in their senior years. Signs of loose teeth and/or pain in the mouth can oftentimes go unseen. A visual check of the mouth may give you insight and they may need Veterinary care to rid them of the painful cause. They may stop eating hard kibble as it causes discomfort. Switching to a soft dog food can be detrimental to the pet if it still has teeth to chew with. Soft dog food doesn’t allow the chewing of food to work off the plaque and tartar that lead to decay. Using soft dog food can bring early decay to your dogs teeth. Bad breath in older dogs is common. To offset the stinky breath you can use breath freshening spray or treats. For more info visit: Chihuahua dental care, Guide and Advices. With age comes a loss of immunity to some conditions the dogs system might be able to fight off when younger. Allergies can pop up later in life due to this and other variables. Itching and dry skin are also a common issue in chihuahua senior dog care. Supplementing omega fatty 3 oils can help dissuade these issues. Diet is important in caring for dogs of all ages but is extra important in their later years. A senior blend dog food can also help combat these signs of aging. In general, like senior humans, dogs will slow down their activity and may lose interest in some things. They may want to rest more and sooner than in their earlier years. 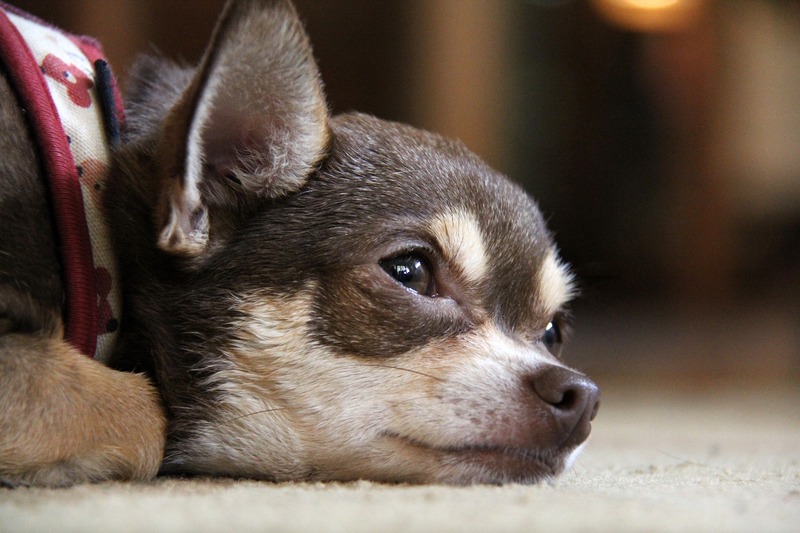 Chihuahuas can get irritable and may bite more readily as seniors. This is the only way they can let you know they don’t want to be bothered. Keeping them active is important but only to the point they are not showing signs of exhaustion. Your senior chihuahua may become less tolerant of other dogs and children. Giving them their own space out of the way of everyday traffic can be beneficial. Veterinary care may be needed more often as issues occur and the Vet is your best advisor on problems. Next articleHow to Care for Chihuahua Ears and Eyes, Guide and Advices.